Degree or Diploma candidates will be selected for Apprenticeship Program. There are 73 Graduate Apprentices vacancies and 96 Diploma Technician Apprentices in this HECL Apprenticeship Program. 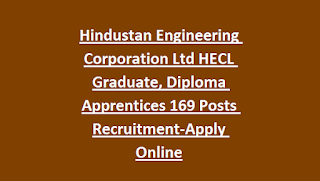 Last date for submission of application form for this HECL Graduate/Diploma Apprentices recruitment 2018. First merit list will be released 29-12-2018 for HECL Apprenticeship Training. 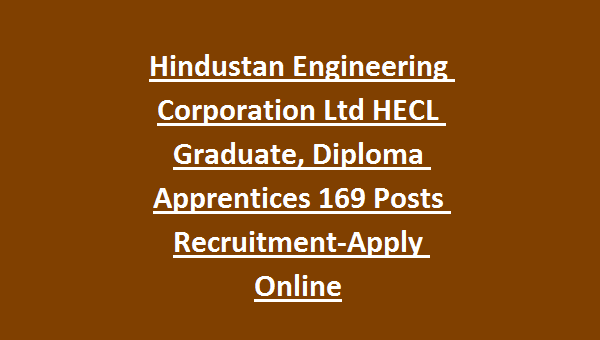 Qualification, Stipend, Application fee and other details are given below for this HECL Graduate/Diploma Apprentices Recruitment 2018. There are total 169 Graduate Apprentices and Diploma Apprentices recruitment 2018. 5. Mechanical / Production Engineering. 6. Metallurgical Engineering / Foundry Forge Technology. 7. Secretarial Practice & Accounts / Office Management & Secretarial Practice. As on 30-11-2018 candidates age limits are 18-30 years. Degree or Polytechnic Diploma qualified candidates are eligible for this HECL Recruitment 2018. Application fee is Rs.500/- for General and OBC candidates. Based on candidates marks in qualifying exams merit list will be prepared. Those who are in merit list they are only eligible to attend the interview or counselling. Apply online through official website of http://hecltd.com/jobs-at-hec.php. Last date to submission of application form online is 10-12-2018.